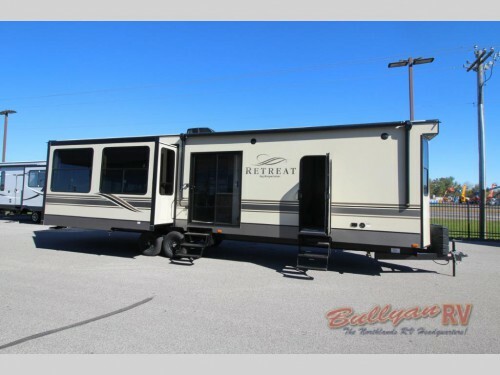 Right now you can find incredible savings on the Keystone Retreat 391RLTS destination trailers for sale here at Bullyan RV. Find a spacious floorplan perfect for long term trips to anywhere, and with savings up to $13,600, you can have more money to spend while vacationing. 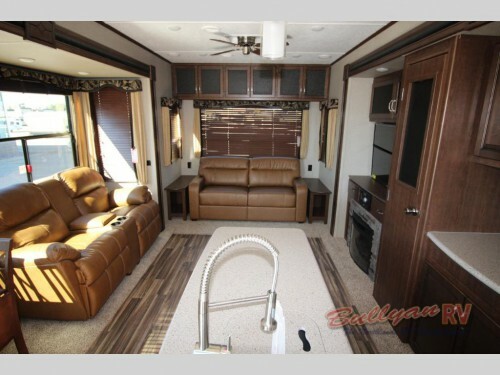 Save thousands on our Keystone Retreat 391RLTS Destination Trailers! The best part about getting a camper like the Retreat 391RLTS is that is built to provide ample room for high quality features. This model comes with three slides and enough room to sleep up to four people. Plus, with this much space inside, you’ll find plenty of amenities to keep you comfortable no matter how long or short your vacation. Inside the patio doors entryway, you will step into the combination living room and kitchen. Here you will find large, dual opposing slides to house everything need to be comfortable. The entertainment center with its HDTV and built-in fireplace will be perfectly viewed from the tri-fold sleeper sofa and theatre seating. Plus, the addition of a ceiling fan in this area will keep the temperature at the perfect level for you. The spacious interior is perfect for long and short term trips. 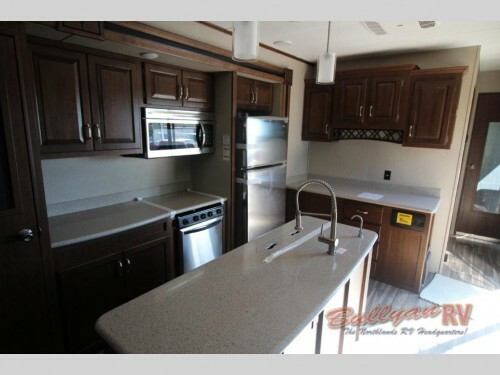 The kitchen of this Keystone Retreat destination trailer will come with the upgraded stainless steel appliance package to provide you with the highest quality features available. The kitchen island and free standing dinette table will offer more countertop space as well as the perfect place to enjoy your meals with your family. A kitchen island and stainless steel appliances makes cooking easier. 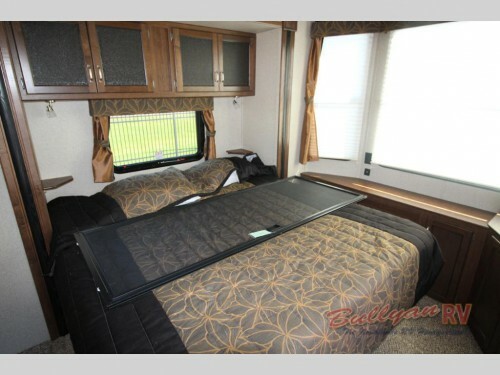 At the front, you will find the large master retreat complete with king size bed slideout. Have plenty of storage space for all of your clothing on long term trips with the corner dresser, armoire, and more. Plus, there will be a second entry way door directly to this room to give you faster and easier access to the bedroom as well as the full bathroom nearby. Reach the king master bedroom and bathroom through the conveniently located 2nd entry door. Whether you like to spend weekends at the campground or travel south for months at a time during the winter, our Keystone Retreat 391RLTS destination trailers provide you the comfort and security you need for a stress-free trip, and at a low price of only $37,995, you can get the same great camper while putting money back into your pocket. This incredible RV is not likely to last long on our lot, so make sure you contact us or stop by our location to find out how you can drive home with one today!